West Germany Mini Sheet Collection 1995-96: Pristine collection of 62 mini sheets of 10 including Scott #1800-7, 1858, and between #1878//1924 plus semi-postals #B775-8 and B784-91. The 2007 Scott value of these 62 mini sheets as single stamps is $897, without the premium for mini sheets. These mini sheets are presented in Lindner double-sided black full-page stock pages. The Lindner price of the pages is $24.75. A very nice grouping that is surprising difficult to assemble if you are looking for these. Priced at only approximately 70% of original face value! Germany First Day Covers and Souvenir Cards 1959-1961: Between Scott #805//841, B368-75, 9N125//195, 9NB21-4, a marvelous 1959-1961 collection of over 100 first day covers and privately produced souvenir cards, about evenly divided between West German and Berlin issues. Most with cachets, mostly unaddressed, virtually all in VF quality. A few have both West German and Berlin franking on the same item. Many of the issues have matching designs of the first day cover cachet and the souvenir card artwork. I suspect that some of these souvenir cards are quite scarce. A very colorful and compelling assemblage which now would be virtually impossible to duplicate! Great Britain Selection of King Edward VII Issues 1902-1911: Between Scott #127//150 accumulation of over 90 used King Edward VII issues, 17 different in varying quantities. Wide variety of shades and printings, plus some useful town cancels. Condition varies, but nearly all sound and F-VF. A few damaged were not counted in the Scott 2014 catalog value which totals over $1825. An ideal lot for anyone who likes lots of catalog value at a low percentage! A great era for specialization! Great Britain Scott #33 "Penny Red" Complete Plating (#98) of 240 Stamps: Scott #33, Gibbons #43-44 (two color shades of the "G" series stamps), 1684 1d Red perforated Queen Victoria. Plate #98 complete sheet reconstruction of 240 stamps including all positions from AA through TL, neatly arranged and labeled, in black mounts on five pages. Quality varies from sound and F-VF to minor faults (as is typical for a plating), but overall are very presentable examples. Most have light cancellations and the plate number is visible on all. I have not checked for inverted watermarks or repair (re-cut) impressions. Scott 2019 value is $7.00 per stamp for Plate #98, times 240 equals $1680! Gibbons Victoria 14th edition (2006) is 6.50 pound per stamp, equaling 1560 pounds or about $1980 (12/6/2018)! These catalog values do not begin to reflect the rarity and number of stamps (probably hundreds of thousands?) that had to be examined in order to build this plating. An incredibly impressive assemblage! It is a daunting task to assemble a complete reconstruction of 240 positions without regard for plate number. To accomplish it using only one plate number (and a somewhat scarce one at that) is a monumental achievement that probably took several decades. Here is an opportunity for you to own a single-plate-number plating without having to invest hundreds or thousands of hours of effort! Great Britain First Day Cover Collection 1964-1984: Collection of over 100 nearly all-different covers of the 1964-1984 period. Mostly cacheted first day covers, the vast majority bear complete commemorative sets and even a couple with souvenir sheets. Most are addressed to Poland, were actually mailed, and some even have Polish receiving handstamps on the reverse (if exhibiting in thematic exhibits, judges like to see receiver markings). Most of the cancellations are official FD cancels, but are small town official FD cancels, not the typical locations. A few are ordinary (but first day dated) postmarks, which are quite unusual in this era. Also includes a few event covers with Polish connections (Papal visit, Warsaw uprising anniversary, etc.). Condition nearly all VF and most would retail in the $1.50 to $3.00 range. A very colorful collection with a tremendous range of many topical stamp issues. Great Britain First Day Covers 1992-1997 Collection: Collection of about 44 different neatly (typed) addressed first day covers with official Royal Mail cachets. All complete sets (one set per cover) representing a tremendous range of topics including animals, Royals, art, literature, sailing, history, war, theater, EU, Christmas, birds, time, flowers, orchids, ships, Sherlock Holmes, berries and nuts, trains, Channel Tunnel, sports, D-Day, golf, science, cats, Shakespeare, rugby, soccer/football, cinema, autos, airplanes, horses, etc., etc. Contained in handsome, new-looking maroon "Royal Mail First Day Covers" binder. Scott 2008 value just as used stamps is about $180! Great value (even for a dealer or eBayer)! British Empire 1949 UPU Omnibus Collection: Collection of 315 different 1949 UPU omnibus issues, complete except for the New Hebrides French currency set. NH VF except Hong Kong set is lightly hinged. Neatly displayed in special padded stockbook. Typical dealer advertised selling price is over $400 (all NH about $465). Not an easy unit to assemble! 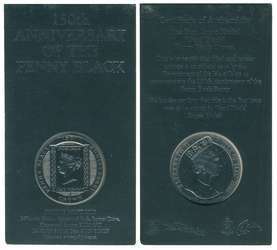 Great Britain Isle of Man: 1990 1 Crown Penny Black 150th Anniversary COIN. VF. Legal tender coin struck in Pearl Black Cupro Nickel picturing Queen Victoria PENNY BLACK stamp on obverse with portrait of Queen Elizabeth II on reverse. Mounted in handsome protective display card. A nice accent piece! The mint still sells this at $24.95 each. Up to 5 available.